A Russian Proton-M rocket launches from Russia's Baikonur Cosmodrome in Kazakhstan. PARIS - Russian Satellite CommunicationsCo. (RSCC) expects to begin commercial operations of its new Express-AM33telecommunications satellite by early March following a successful Jan. 28launch by a Russian Proton-M rocket from Russia's Baikonur Cosmodrome in Kazakhstan, RSCC said. The2,600-kilogram Express-AM33 spacecraft was built by Russia's NPO-PM, the prime contractor onthe project. The spacecraft's payload, which was provided by Thales AleniaSpace of France and Italy, carries 10 C-band and 16 Ku-band transponders, plus asingle L-band transponder. It will operate from 96.5 degrees east longitude andwill serve customers in Russia and in the Asia-Pacific region.Express-AM33 has an expected in-orbit service life of 12 years. 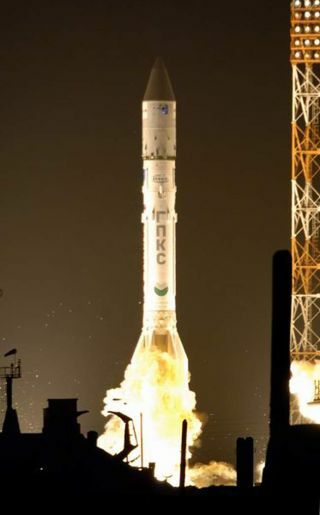 NPO-PM andRSCC said in separate statements that the satellite had successfully separatedfrom the Proton-M's Breeze-M upper stage, deployed its solar panels and beguncommunicating with ground controllers. RSCC hadtold prospective Asian customers in mid-2007 that the satellite would belaunched in September of that year. The company later expressed frustrationthat the delivery of the payload, built in France, would not occur soon enough to permit a 2007 launch. RSCC hasplans to launch the Express-AM44 satellite, which is being built by the sameteam led by NPO-PM and Thales Alenia Space, in mid-2008. Theapparent ease with which RSCC was able to insert the Express-AM33 into thecrowded launch manifest of the Proton vehicle irked another Proton customer, Telenorof Norway, sources said. Telenor's Thor 2R satellite was forced to give up itsslot on behalf of the RSCC satellite, which is viewed as part of Russia's Federal Space Program. Thor 2R,which is being launched under a commercial contract managed by International LaunchServices, is scheduled for launch Feb. 10, according to Proton's primecontractor, Khrunichev State Research and Production Space Center.